Gaijin Entertainment let fly its new World War II combat flight sim Wings of Prey on Christmas Day, and now there's a downloadable demo for those of you pondering dusting off the old flight stick. Wings of Prey is a pretty robust PC combat sim, with more than 50 missions, 40 planes, and extensive online multiplayer set across six different theaters - The Battle of Britain, Stalingrad, Ardennes, Berlin, Sicily and Korsun. 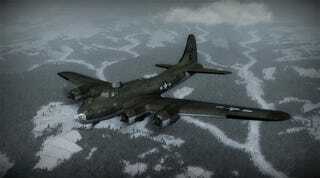 Gaijin released a 1.46GB today, giving players a small taste of the game's tutorial and a couple missions above the skies of London. You can snag the demo by clicking on some text within this post, or visit the game's official website for the latest trailers, screenshots, and wallpapers.